Vineyard owner Julian Johnson and winemaker Matt Copeland know that their clay soils and cooler micro-climate produce a Merlot unlike any other in the country. It is not a variety South Africa is particularly highly rated for. So Julian and Matt set out to prove the doubters wrong. Hence Q.E.D. – quod erat demonstrandum. Cooling south-westerly winds blow across the vineyards in the afternoon, sweeping in from the Atlantic and keeping them 5 degrees cooler than the nearby vineyards. A blend of two terroirs: the cool climate Sauvignon of Elgin, blended with structured Sauvignon from old vines from an established Stellenbosch estate. 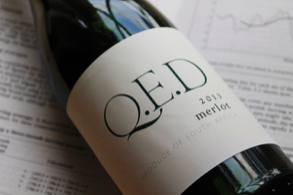 The Elgin fruit adds freshness, acidity and classic Sauvignon zing to the blend, the Stellenbosch fruit an extra level of richness. Jeff Grier has blended these into a seamless entity that makes the best of both these premium regions.